We planned for day two the night before. A rooftop cafe breakfast fueled us for our trek to Swayambhunath, or Monkey Temple as it’s commonly called by tourists. The walk took us at least an hour and I got some great shots as we passed through the city. Soon we could see our destination high on a hill in the distance, and I remembered the temple being lit up the previous night. It was exciting to know we were closing in! At the base of the temple we were engulfed by kids trying to get money or food out of us. They were smart little guys; I quizzed them on the capital cities of the world and they got a lot of them right! I don’t think we gave them anything (it’s generally my policy not to), and by the time we reached the really steep steps they had given up on us. We finished our climb and were rewarded with an awesome view of the valley. We enjoyed the architecture and atmosphere, but ended up spending a lot of our time monkey watching. There were whole groups (families??) of monkeys all over the temple, interacting with people and just hanging out. 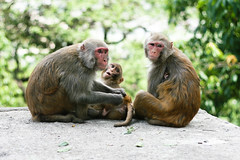 We saw everything from little infant monkeys nursing in mama’s arms to old grandpa monkeys lounging lazily in the shade. We still had a full day ahead of us and needed a break from walking in the sun, so we grabbed a taxi and headed off towards our next destination. 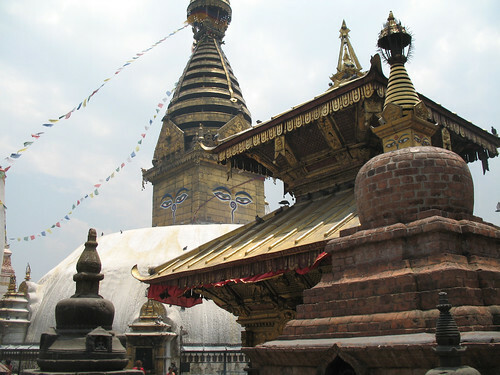 Nepal’s most important Hindu temple reminded me a lot of my trip to Varanasi. 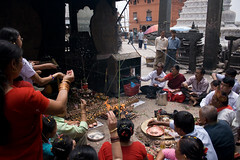 Cremations are performed there daily on the banks of the holy Bagmati River. Non-Hindus are not allowed inside the temple, but there is plenty to see outside the towering walls. We explored the rugged terrain as high as we could go before turning back down and finding some more steps up to Gorakhnath and Vishwarup temples. There is a lot of beautiful architecture packed tightly together up there, and we weren’t quite sure what was what, but we paused to enjoy the cool breeze coming through the trees and flip through the descriptions in our guide book. We were up for some more walking and made our way around the hill and through the streets to Bodhnath – one of the largest Stupas in the world. I was again amazed at how the Buddhist Stupas have such a close tie-in with the surrounding businesses. 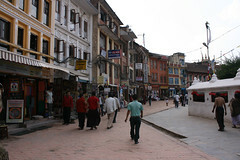 As with all the sites we visited we had to pay an entry fee of several hundred Nepalese rupees, and past this point there were scores of restaurants and shops catering to tourists. We found a rooftop cafe and indulged in some buffalo momos. They were more expensive and not as good as the street momos from the previous day, but the view was nice and the weather just playful enough to make us want to sit and take it all in. They were also really slow with giving us our check. The day was growing long and we still had a very important stop to make, so we continued our clockwise walk around the Stupa and headed back out to the street to hail a cab. We heard about this from the British woman we met at our guest house on the first day. It sounded extremely interesting and we couldn’t pass it up seeing as we just happened to be at the right place at the right time. We headed a short distance outside of Kathmandu to another city (the name escapes me at the moment) and quickly found the chariots. Topped with what looked like Christmas trees standing several stories tall, they were hard to miss. People were mulling around and a crowd was starting to gather, but it seemed nothing was going on just yet. We asked around for some chai and ducked (literally) off the street into a private domicile to be served. 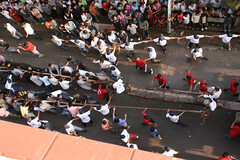 Soon the festivities started and we re-emerged onto the street to watch scores of children and volunteer adults as they pried the immobilized chariots from their night-long slumber. It reminded me of a scene from Lord of the Rings, with huge armies pulling war chariots in to battle. The energy of the festivities was electric, and we wanted to get up on the rooftop to get a better view. As we stepped into the corridor of a building along the street I felt for my wallet. It was gone. I had been so engrossed taking pictures that I absent-mindedly put my wallet in my back pocket after giving Cait a few rupees to pay for the chai. Someone – probably a little street kid – skillfully snagged it from me. It only had the equivalent of about $35 in it, but I had to cancel all my U.S. credit cards and apply for a new Indian income tax card. At the end of the festival we got a rare chance to see Kumari up close! You’re really not allowed to take pictures of her, but I did anyway. They shewed us away and we headed back to Kathmandu to head out for a nice Italian dinner and some crazy local singing and dancing into the wee hours of the morning. 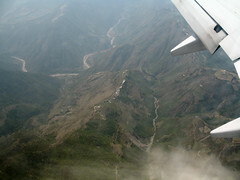 Dropping in to Kathmandu Valley I found my window seat view of the ground was obstructed by low-hanging clouds. Then I realized they weren’t low hanging at all; the ground here is over 4,000 ft above sea level. Soon mountains and valleys sprang up gasping for air from the wispy abyss and before I knew it we were bouncing lightly down the runway of KTM airport. We stepped off the plane onto the tarmac and were welcomed by mild sub-tropical weather. Only one hour and fourty-five minutes from Delhi and such a drastic change. It must have more to do with the elevation than the longitude. We didn’t check any bags so we made fast to immigration. We had to get visas. They were free due to our short stay, but we had to pay for the photos. After a painless process and a new stamp on the old passport, we scurried out to the motor pool to find our cab from the Kathmandu Guest House. We started out politely declining invitations from random cabbies but this turned into aggressive refusals before we were finally rescued by a guy with a sign. The guys with the signs aren’t always the real deal, but in this case he also had a van with a legit logo. And other passengers. We figured this was our guy. My first impression of Kath is that it’s like a cleaner more interesting version of India. The architecture is more inspired and it’s a lot less crowded and easier to keep things in order. The trip to the guest house was about 30 minutes and we saw everything from protests and armed guards around embassies, to western-style strip malls on crowded streets. As we approached Kathmandu’s Thamel neighborhood the streets narrowed to barely two car widths, but somehow the van made it all the way inside the gates of the guest house unloading humans and luggage in one fast motion. We had a reservation but wanted to snag a garden-facing room. Turns out they didn’t have one available, but they let us see one of the “new” rooms instead. These were nice but lacked character and were more expensive. 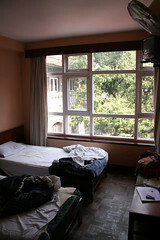 We opted for a normal room and were much more satisfied by our view of a tranquil courtyard full of trees. We had hot running water in the shower, two beds, plenty of drawer space and a nice fan to keep us cool. Not bad for $25 USD per night. Unfortunately I had to get some more work done so we spent the next few hours hanging out in the courtyard. We met a nice British woman who spends months in Kath at a time. She gave us some great tips on what to see. 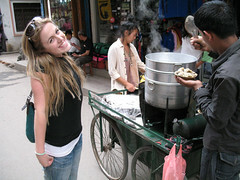 Cait used the extra time and our Nepal Lonely Planet guidebook to plan our afternoon outing. 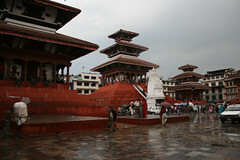 It looked like rain was coming but we wanted to check out Durbar Square. Our only problem was that I had to find a memory card for my camera since I realized on the plane that I’d left mine at home. We picked up some momos to silence our grumbling guts and found a store that sold brand name stuff at too high of a price. I bought something despite the fact it is 4 times cheaper on Amazon. 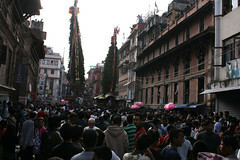 We tried to take a direct walking route to Durbur Square but it turns out foreigners have to pay 300 NPR (Nepalese rupees; $4.65 USD) to enter the streets. We weren’t cool with this and Zuko told me we could sneak down a side alley if we were “slippery”. Sure enough the rain started and we got stuck in a back alley sans umbrellas with some of the locals. I was busying myself taking artsy shots of our surroundings when I was suddenly dumped on by a gutter full of water. I won’t go into the details, but it was gross. When the rain died down a bit we took off on to the main street. We were past the most aggressive ticket collectors already and found our way into the heart of the square with ease. 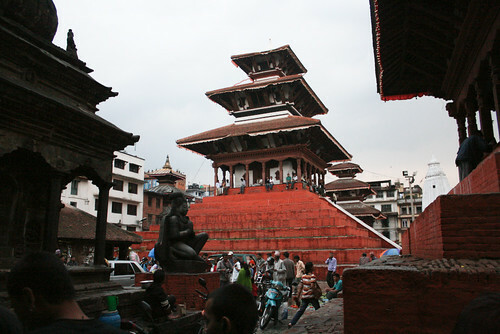 A bustling center of activity with temples, markets and shrines, it held our attention well unto dusk. The rain started and we had no rain gear, so Cait bought some more comfortable sandals from a small shop and we caught a cab back to Thamel. We got cleaned up and headed out for a night on the town at the awesome bars and restaurants up and down the main Thamel drag right outside KGH. I will say this about the live music in Thamel: it’s awesome. It seemed every restaurant and bar had their own act, with vocals and instruments pouring out into the street below. We settled on a place recommended in the Lonely Planet for some pre-dinner drinks. 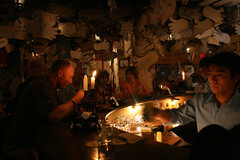 The atmosphere was cozy and the band was entertaining but we didn’t see any food on the menu we liked. Besides, we really wanted an authentic cheeseburger. We settled our bill and hit the street. The problem with printed guidebooks is that things can change and you won’t know it. We had a hard time finding the burger joint and when we did, it was closed. Instead we headed for the next-best thing: mouth-watering juicy steaks at Kathmandu Steak House. After months in India without a true slab of nicely cooked beef tenderloin steak, we were in heaven. And damn was it cheap (about $5 usd for a 14 oz cut). Walking back to the guest house with full bellies was a bit of a challenge, but falling fast asleep excited for tomorrow was not.